The Dorothy Gibboney Collection consists of materials collected by Gibboney from 1966-1980. Materials include correspondence, news clippings, awards, photographs, and programs and speaking engagements. Most of the correspondence was received during her tenure as superintendent of Roanoke City Public Schools. Items in the collection are of personal rather than administrative nature. 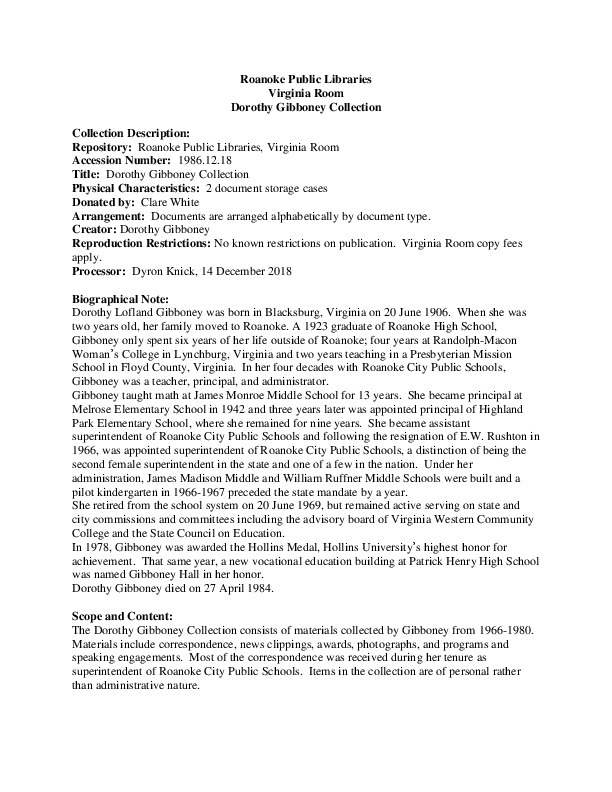 Roanoke Public Libraries, “A Guide to the Dorothy Gibboney Collection,” Virginia Room Digital Collection, accessed April 21, 2019, http://www.virginiaroom.org/digital/document/GibboneyCollection.